>Following Pierce with Lucent close behind, you enter the Skull and are greeted with sweltering heat from a forge near the back. Behind the forge is another door. This one of black marble suspended in the white wall, a dark, unopened oval. Princess Celestia and Luna are standing on raised platforms on the left and right sides of the brain respectively with the Elements of Harmony standing in the middle beneath the rock. >Both of the princesses have their wings spread out and their horns alight with magic. In the center, beneath Glaurumat's Mind, each of the Elements of Harmony are settled around the purple one, Twilight, at the center. She seems to be standing in much the same way as the princesses, but while Luna and Celestia are also facing her, Twilight has her horn directed at the forge. Two bright lights are connected to her: one from the Mind and into her horn, the other from her horn and towards the forge where Thorn is working with Gold Heart. Luna and Celestia's magic seems to be powering the platform that all of this is taking place on. >As you move towards the back of the room, it only gets warmer. Sweat is already beading on your forehead and you can see it dripping off of Gold Heart as she bends the light into shape with her hammer. Thorn is keeping everything lit with his own flaming breath and watches Gold Heart work. Lucent is talking calmly with Gold Heart while she hammers away. The black oval door looms nearby. >"When the Mind was first used for the forging of the chains," Gold Heart explains as she continues hammering the Harmonyllium, "The Elements of Harmony weren't the six ponies you see in the center. They used to just be stones. Those stones were placed in the center and their magic was used to draw out the Harmony within Glaurumat's mind. Celestia and Luna weren't strong enough to activate the spell by themselves, so they worked together to power the Elements." >"With the Harmonyllium extracted," Gold Heart continues, "it needed to be forged into something that would hold Tiamat indefinitely. Many types of imprisonment were suggested but chains were settled upon after a pony blacksmith and his dragon assistant proved their work to be the strongest at holding dragons in general." >"There was nothing special about the blacksmith or this dragon," Gold Heart says with another strike, "but the princesses believed that the symbol of the two working together would resonate with the Elements of Harmony and make the chains that much stronger. These two eventually became the first ambassadors of Taloran and the station has been occupied by a dragon and a pony every since." >"What's behind the black marble doors?" >"That is one of the gates to Tartarus," Gold Heart points with her hammer. "It opens more like a portal and once you're inside Tartarus, it's almost impossible to escape. It's an endless maze of darkness and despair where the greatest enemies of Equestria are imprisoned." >She complains about the heat while you tell her your glad it's not you forging the chians. Lucent also informs you that at some point they'll take a short break and you'll get to spend time with Luna then. >"Forging the chains is easy," Lucent tells you. "It's knowing what'll happen if you can't that's hard. It's why she'll need you." >Her sole reason for being there: "To watch you writhe and squirm like the trapped little vermin you are,"
>Tiamat didn't even need to grab Lucent. She just wanted some leverage over you and Lucent just happened to be the unfortunate one to be grabbed. "I'm going to hold your dear friend, lover, or whatever she is to you, hostage and you're going to stop forging the chains," Tiamat says, then yawns from her imaginary seat. "I thought you were smart enough to have figured that out by now." "So there is no way to take advantage of her being in my dream?" you think to Luna. "No," she tells you. "This is but a dream. What you see before you is a mere representation. Destroying her in the dream would do nothing to her in the waking world, not matter how much power you have here. "I am afraid you forgot a critical detail when you came up with that plan." Lets bait her first. Depending on how she replies we could tell her that taking Lucent hostage is pointless because we do not have the authority to tell the others to stop forging the chain and they were very clearly willing to abandon Lucent to her fate. Though that might pose the risk of Tiamat seeing her as worthless, but I'm kinda running out of ideas how we could turn this in our advantage - we could offer a trade, but Luna would never agree to that. "I have no need to worry about the little details," Tiamat says and summons a nail file in her hand. "There's nothing you can do to place this situation in your favor, though it is amusing to see you try." Tiamat begins to file away at the claws on her gauntlet. "What makes you believe I could stop anyone from forging the chains?" Ask Luna (telepathically of course) if there is any way to get Lucent out of Tartarus without entering it now that we know where exactly she is. "You already have," Tiamat says with a smile. 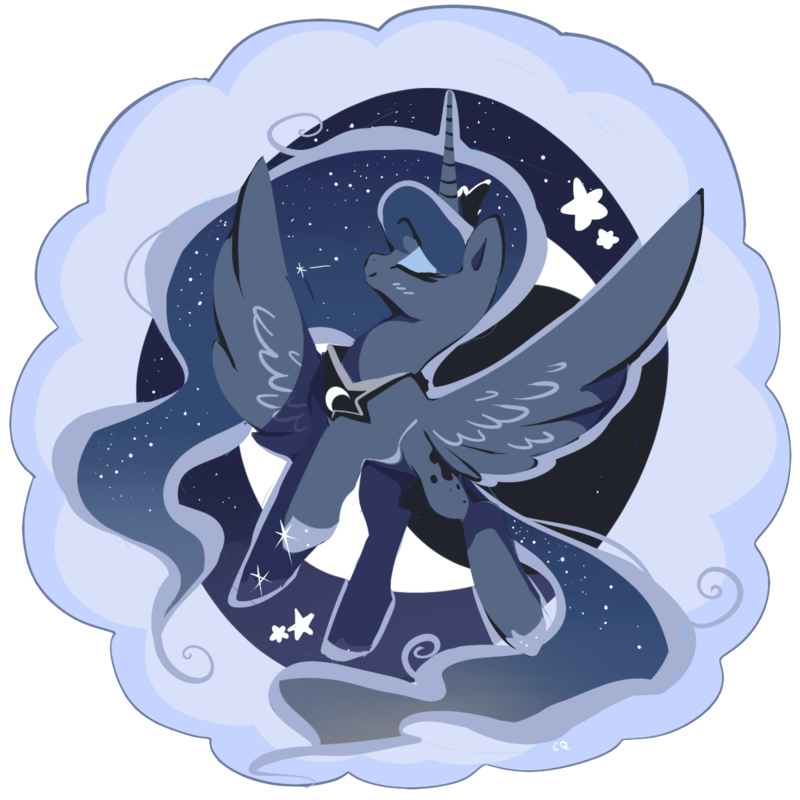 "Or am I mistaken in assuming that Princess Luna is not, in fact, asleep and standing next to you in this dream?" "Is there any way we can get Lucent out of Tartarus without entering it now that we know exactly where she is?" you ask Luna. "There are other gates," Luna tells you, "but there is a chance that Tiamat is no longer behind the gate in Glaurumat's Skull. She could be standing guard over Lucent." "And if you don't stop making the chains," Tiamat continues, "I will do more than just remove your friend. I'll make sure she suffers. Your choice, really." I guess it kinda looks like we won't have a choice in regards to getting Tiamat out of there - threatening her won't work. We could still stir the conversation into another direction and reveal what we truly are to see how she reacts, but then we give up the surprise moment. Or well, at least not unless we find something that she is truly afraid of and use it to make sure that she thinks hurting Lucent is not the best idea she could have. Create a few copies of Luna via dream wielding. "Who knows? Its a dream." You use dreamwielding to make a few copies of Luna. "Your will isn't the only one that exists here," Tiamat says and banished the copies with a wave of her hand. "Luna," you ask, "is there anything Tiamat is afraid of?" Luna is silent for a moment, and then you hear the name "Glaurumat" in your mind. "Resurrecting Glaurumat would doom us all," Luna stresses. "Not only would we have to free Tiamat in order to once again put Gluarumat to rest, but Tiamat would have her freedom once it was over. That is also in the unlikely situation we survive against Glaurumat." Alright, so, my last idea is the following - we ask Luna if she can telepathically show us a picture of what Glauramat looked like while we ask Tiamat if she has any idea what was hidden behind the door she pointed out to us. If her answer is no we use dreamwielding again to let Glauramat's face shine through ours and give her a grin. Maybe its enough to scare her into keeping Lucent save as bargaining chip for further encounters. What does the rest think? Also what exactly do we even know about Glauramat past him being dead and his corpse being used to keep this city afloat? We have no other plan so far so I guess its worth a try. We can always abort halfway through and not give any hints as to what was behind the door if we decide otherwise. If she's curious enough it might be worth it to just bait her and then kick her out of our dream without giving her an answer to it. "So, say Tiamat - did you ever find out what was behind that door you showed to me?" "Can you show me what Glauramat looked like"
And to A.J., can you give us a quick recap about what we know of Glauramat past his mortal remains being used to keep the city floating? "No," she says. "Though now that you've brought it up, I noticed it's no longer around. Tell me what happened to it." She stands, tossing the file aside and walking towards you to receive her answer. "Can you show me what Glauramat looked like?" you think to Luna. "Not without alerting Tiamat that I've done some sort of magic," Luna explains, "but I will do my best to describe him from pictures I've seen." Glaurumat had a surprisingly kind face for one of the most terrifying beings to exist in Equestria. Where as most of everything about Tiamat was jagged and sharp, Glaurumat was very smooth and rounded. His metallic gray scales came off of him like plates of armor and had dark red eyes. His wings were ethereal, much like Luna and Celestia's mane, but consisted of what looked like a silver powder. That's as much as Luna is able to tell you. You know that his mind is what powers Taloran's flight and that his Skull lies beneath the city. He was the Father of all dragons as Tiamat was the Mother. Should the harmony be drained completely from Glaurumat's Mind the city of Taloran will crash to Equestria and be destroyed. That is as much as you know. I guess the face would be too easy to get wrong and give it away, but we can work with the gray scales, red eyes and ethereal wings. I'd suggest we let all of that kind shine through our body, then make some statement along the lines of "Lets just say I went on a journey to find my true self", give her half a second or so to see her reaction to it and then expel her from our dream. The only disadvantage would be that we don't know what she'll be doing afterwards, but it should at least confuse her. Alternatively we ditch the Glauramat bluff, just make some vague comment and expel her too, which would probably peak her interest and might distract her enough that we can save Lucent. Yeah, we don't have a great hand so bluffs have to be in manners that don't allow her to exert her position. So, which one do we go with? Pretend to be Glauramat and maybe make her worried or just expel her without any kind of info and leaving her curious and distracted? Lets just go with the Glauramat bluff - we'll have to go into Tartarus anyway, at least that way she might be a bit distracted when we show up. >"Tell me what happened to it." ".. you already know it." Give her half a second or something so we can see her initial reaction, then kick her out of the dream. If we can't kick her out, telepathically tell Luna to wake us up. "Oh, lets just say.." using dreamwielding, you give yourself the red eyes, etherealsilver wings, and gray scales Luna described to you. Before another word can leave your mouth, Tiamat's claws have dug deep into your chest and her teeth are grit in a seething rage. With a violent roar, you're shaken awake and gasping for air. Luna is by your side, holding you for comfort while you catch your breath. Celestia, Thorn, Gold Heart, and the Elements of Harmony are gathered around you. Echoes of Tiamat's roar reverberate for a moment within Glaurumat's Skull. "What did you do?" Celestia says, leaning down next to you and Luna. "What happened?" "I thought you said 'afraid', not 'filled with killing frenzy'?" "That is how she expresses her fear for Glaurumat," Luna says, hanging her head. "When cornered, filled with terror beyond imagining, Tiamat refuses to flee. It is not in her nature." There are tears in her eyes as she places a hoof to your cheek and looks at you. "I wish you had told me you were going to antagonize her that way," Luna says. "The image of your death will not be one easily erased from my memory." "Good thing it was just a dream this time. What did Glauramat do to her to make her that terrified?" Brush her tears away to calm her down, too. "Good thing it was just a dream this time. What did Glauramat do to her to make her that terrified?" "Glaurumat's power is overwhelming," Celestia explains. "No one can overcome it alone and Glaurumat was the only thing keeping Tiamat from claiming this world as her own. Not only that, but Glaurumat is the only one capable of truly killing Tiamat." "When Tiamat sought to usurp Glaurumat," Luna continues, "he nearly killed her. Had it not been for the aid of the other races of Equestria, her life would have ended there as would the rest of life in Equestria. By her greed did she incite a rage in Glaurumat, and by her betrayal did she ensure her death by his claws. Should Glaurumat be resurrected, she knows she will die." >"What did you do?" Celestia says, leaning down next to you and Luna. "What happened?" "I pretended to be Glauramat. Tiamat said that she would torture Lucent unless I stop you from forging the chains, so I thought if I scare her she might decide that keeping Lucent as a life insurance for later is a better idea. But with her reaction to my bluff I am not so sure that I didn't make it worse." There was a reason why we couldn't kill Tiamat past "because we aren't capable of doing so", wasn't there? "So the only way to stop her is by summoning something even worse. Fantastic." "Despite how you've done it," Celestia says, frowning, "you've managed to confuse Tiamat for the moment. I doubt she would hurt Lucent now, though if she really thinks you're Glaurumat, there's nothing to stop her from doing something desperate." "Before," Luna adds, "Tiamat saw him as naught but a toy. Should it be true that Tiamat views him as a threat, she may also be more cautious in her actions." Celestia stands and places a hoof to her face for a moment. "We risk doing that already with the forging," Celestia says as she places her hoof down. "Tiamat doesn't know the city remains in flight, so if she truly believes that Glaurumat is alive, we might be able to manipulate her into acting against her best interests." "You mean trick her? Won't she see through it instantly?" "She's afraid," Gold Heart says, taking her position back at the forge. "Ponies do stupid things when they're afraid." "It might seem foolish," Celestia says, smiling at you. "But foolishness has gotten us this far, I suppose." "Without a plan you'll kill us all," Pierce says, offering a claw to help you up. "So what do you plan to do?" "What do you mean, we are doing that already with the forging? Is there a threat of awakening Glauramat by doing so?" >"Ponies do stupid things when they're afraid." If she was a pony we wouldn't be having all these problems. "My initial plan was to scare her to make sure that she doesn't hurt Lucent and possibly confuse her so that I might be able to sneak in and free Lucent while she is distracted - Celestia made it sound as if she had a better idea though." If Celestia doesn't have any idea we can probably see those lines as hints for a solution we have to come up with ourselves. "If she's afraid, then we'll milk her fear for all it's worth." Did we ever decide what to make with the harmonyllium? >Did we ever decide what to make with the harmonyllium? No, not yet. We hadn't really figured out what would be the most useful thing to make out of it. > we could give him our present for Luna and tell him to use the Harmonyllium as inlay. The present is supposed to remind her of us, so maybe the Harmonyllium turns it into a compass that will always lead her to us. Or we can use it as homing signal to get back to her if Tiamat does wreck our body. What is this, Celestia Quest? "Taloran falling out of the sky isn't the only thing we have to worry about," Celestia answers. "Beneath us, buried in the land below, lies Glaurumat's body. Should the Mind and the Body reunite, Glaurumat will rise again. The harmony inside his mind is the only thing preventing that from happening." You rise to your feet, not taking Pierce's claw. He pulls it back, clenched in a fist, and listens to what you have to say. "So going into Tartarus is still on the table, is it?" Pierce strokes his chin as he speaks. "We could use your position as Glaurumat to lure her to our side," Celestia suggests. "If we play along that Glaurumat was resurrected, we may be able to convince her to let her guard down and join our side." "And how will you save Lucent?" Gold Heart says, motioning for Thorn to stand by her. "Clearly, Tiamat believes you care for her to some degree. For her own safety, she may keep Lucent as a bargaining chip." "We would also be at great risk for losing Lucent should Tiamat uncover our ruse," Luna says. oops. I meant to take his claw. guess I should have clarified. "She wouldn't sacrifice the only thing postponing her imprisonment." "But even if we can pull her onto our side by pretending that Glauramat was resurrected, we'd still need to finish the chains and won't she get suspicious if she realizes you are still working on them?" "So long as you care about those around you," Gold Heart says, readying her hammer, "she will have chances to capture and use them. I don't think you're going to stop caring about us anytime soon, eh, Thorn?" Thorn's deep chuckle resonates inside your chest. "A good heart," Thorn says and stokes the flames of the forge. "I'm counting on it," Gold Heart smiles. "She wants to stop Glaurumat and we want to forge the chains. Neither of us can really have what we want without the other, so the key here is how we can get her to give up Lucent willingly, if we don't want to go sneaking around behind her back and getting her to kill us before we're ready." "What if we convinced her that Glaurumat had taken a liking to Lucent? Or would that be out-of-character for him?" "So, how do we lure her out and make her strike a deal with us? I can't really be of any help for that, she would probably eviscerate me again as soon as she sees me." "Tiamat does have a fondness for you," Luna reminds you. "As twisted though it may be, I see no reason why Glaurumat might not share a similar fondness for a pony." A soft blush, blossoms over Luna's cheeks. "I don't see how we can," says Celestia. "There's a chance we'll have to do this without you. It would slow down the forging, but I'd prefer if we didn't have any pony die to Tiamat, especially a close friend of yours." "If a star can fall for a pony, I guess anything's possible." Kinda looks like we will have to wait a bit to see how Tiamat reacts to our bluff. "If we want to keep this bluff up, I will probably need to find a way to keep Tiamat out of my dreams - I am not sure if she would stay away out of fear on her own or if she might come back for a closer inspection to check if I am really Glauramat." "Is there anything else I should know about Glauramat?" Luna plants a quick kiss on your cheek and heads back to her place beneath Glaurumat's Mind. "Luna should be able to help you with your dreams again," Celestia says, smiling. "We've told you all we know," Celestia answers. "The only one who could possibly tell you more is Tiamat." "Not even Star Swirls knows more about him?" "If I remember correctly," Celestia says, placing a hoof to her lip. "Star Swirl wanted nothing to do with Glaurumat then and he never wants to again. I assumed they had some sort of past, but Starswirl always denied it. Something about the current race evolving beyond their brutish ancestors." "He picks the worst times to want to stay out of things." "Do you think it would be worth the effort to ask him about it? With Tiamat on the loose he should have a good enough reason to talk about it, but if he didn't even want to get involved back when they fought…"
"Star Swirl's sole reason for being involved now is to make sure Tiamat doesn't cause chaos across Equestria," Celestia tells you. "I'm sorry to interrupt, Princess," Gold Heart says from her forge, "but I'd prefer to continue the forging, please." Celestia nods to Gold Heart and then turns back to you. "I know you won't leave your friend behind," Celestia says. "But we can either act now, or wait for Tiamat to strike again. We'll ralk again tonight. You've bought us all a little time and I thank you for that. Please use that time to your advantage as well." Celestia walks away with the Elements of Harmony and they continue to make the chains. Pierce stands beside you and clears his throat. "If you need anything," Pierce says, "do not hesitate to ask for it. As advisor to the king, it would be better if we took care of this situation as soon as possible. It is clear to me now that you are a very important part of making that happen." "Thanks Pierce. I'll let you know if something comes up." "Is there any way to seal the portal at least for the next few days? Otherwise Tiamat might just keep snatching ponies from this room." Should we go and look for Star Swirl to ask him about this? Or go and look for Baron and tell him what happened? On the one hand he should hear about it, on the other hand he might do something stupid. Pierce gives you a nod of acknowledgement and leaves the Skull. Everyone else starts forging again, leaving you alone and wondering what to do now. You need to save Lucent, that's for sure. But you don't know how, and now you have someone who thought of you as just something to play with as her worst enemy. This is probably both good and bad, but until you do something or Tiamat does, you're not really sure which. You do need to do something though… Or do you? Would it really be so bad to just wait and see what Tiamat does next? There's no reason for her to kill Lucent if it'll just bring Glaurumat down on her head. It might just be best to do nothing. It's not like she knows you're still forging the chains anyway. Maybe we should ask Luna if there is a way to keep Tiamat out of our dreams for now so she doesn't find out its a bluff. Shouldn't be a problem, she has already proven that she can work her magic and talk at the same time. I think our first order of business should be consulting with Starswirl. Let's just hope he doesn't try to hold out on us. Gonna cut it here. No changes to the list up top. Please use the /qt/ thread for discussion about what to do next to this thread.